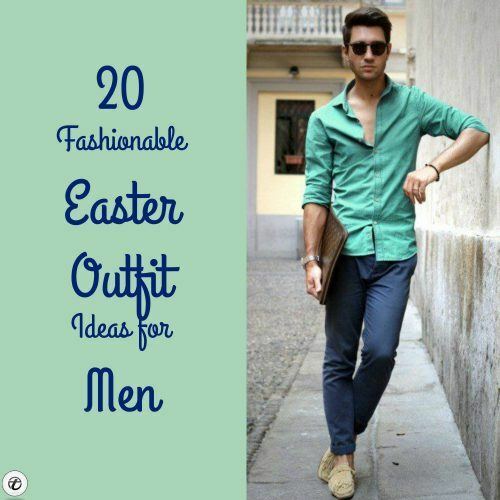 Easter Outfits for Men 2019- Easter comes up with a long weekend which asks for either traveling around a bit to break the monotonous work routine or getting back home to celebrate this religious occasion with friends and family. However, packing has to be economic and full of fashion as flaunting new trends in your hometown will never get old for such festive get-togethers. Men should pace up to stores and avail some of the Easter discounts as well to update their spring wardrobe and save a few items for the approaching summers. When it comes to Easter, you want to keep it simple but why wear simple during holidays? Summer is about to hit with all its glorious trends, hence it becomes mandatory for men all over the world to try at least one or two latest trends during these long weekends. If you are bored and want to try new stuff on this Easter, then get ready to add a few accessories and garment pieces to your existing wardrobe. The article is going to cover 20 coolest style bases for men, making it easier for you guys to pack up your stuff and mix and match perfectly on your Easter holidays. The caprices of weather are to be kept in mind as it is always tricky to dress-up for the religious occasion. Hence, go through this complete guide to have a few ideas sorted for your holidays. You can definitely wear a suit on Easter Sunday but it will be better to keep your bottoms lighter. A button-down light cotton material mandarin collar shirt with half sleeves and a light grey blazer will look perfect. Add shades as it will add to your personality and is mandatory for spring. Wear it with either all-white low-top sneakers or charcoal perforated Oxfords. Here are 30 Amazing Men’s Suits Combinations to Get Sharp Look. Planning to have a brunch with your fam or invited by in-laws for lunch on Easter day? 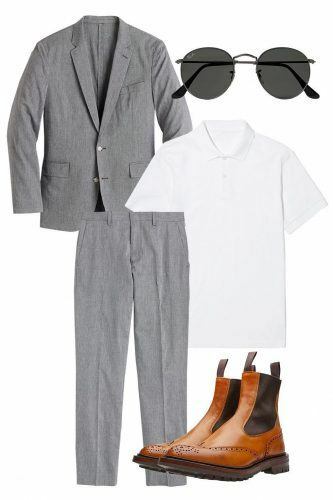 Well, here is your ultimate dress-up key. Go for white slacks with a cool semi-formal shirt in a shade of navy, maroon or green. Wear a charcoal blazer along with it and black mocassins will do their job to add the charm to it. ↓18- What to Wear on Easter Day Party? While packing stuff for Easter, you have to be smart enough to pack the necessary casual garments such that those can be worn on semi-formal events as well. Always pack one or two formal blazers and some cropped straight pants which can be worn at parties and dinners. Dress pants are recommended with a pair of formal Oxfords which can be worn with almost everything. Never forget to keep chambray or collar shirts with you. Chinos and cotton formal collar shirts will never get boring when it comes to dressing up for Easter Church Sundays. Keep your pants cropped, so you can avoid socks and flaunt your ankles as per spring’s requirement. Also, a leather watch will complete this Church look giving you a classy vibe. This Easter you should add some tricky shades to your outfits such as a baby pink blazer over white pants and white plain tee. White tassel loafers will work their magic and make you look like a top-notch model. This idea will work well for guys who are in their twenties and men who are celebrating Easter by the beach shore. For Easter night or evening parties, it is always better to wear black or dark wash denim skinny bottoms along with a denim, leather or bomber jacket. Wear a simple black or white plain tee which will make you look just simple and fashionable, all at the same time. Low-top converse shoes will look appropriate as per the event and season. Here are 27 Ways to Style Guys Blue Jeans. Faded denim jean bottoms and a black varsity over a black and white t-shirt is a perfect option for men who avoid shades other than black or white. Wear black sunglasses with such an ensemble to have a complete alpha-male look. Want to dress like a celeb? Well, you can wear a printed oversized bomber jacket with a round-neck t-shirt inside and deep red pants, just like Ansel Elgort. Go for it only if you find this look comfortable. However, spring is the best time of the year to experiment with your ensembles. Blue looks best during summer especially the faded one or baby blue. Go for blue slacks and blazer and a white shirt underneath. Add a white handkerchief if it needs to be more on the formal side. Pastels are mandatory when it comes to spring especially colors like aqua, lavender, baby pink and pastel purple. A pastel color gingham print shirt can be paired with white denim pants and leather loafers for a springy pastel look. Easter look can be completed with a navy or black double-breasted jacket over a white shirt and accessorize it with a bow tie. Wear denim pants underneath to keep the look on the festive side. A pair of loafers is best to slay with this ensemble. Check out these 25 Ideas on How to Wear Double-Breasted Suits for Men. Geometric prints and multi-color tees are perfect when going out with friends for Easter day breakfast. Add a pair of classy shoes that contrasts with your outfit to have a full fledge funky vibe. Lemon or green colored pants can only be worn with casual collar shirts in beige, sky blue or off-white color, otherwise, you will look overdressed for the occasion. Khaki pants can be paired with a light knitted sweater over a light shirt for Sunday church or brunch. A camel color jacket with a stripy shirt and colored bottoms is just perfect for the spring attire. Easter look gets perfect when double shirts and shorts are incorporated, in case you are celebrating near a beach or hill station. Here are 20 Stylish Men’s Outfits Combinations with Shorts. Gingham print shirts in neutral shades can be pair with bright cropped pants and perforated formal shoes. Cuff the ends of your bottoms on Easter to keep up with the latest trends and go for Amazon color shirts. Leafy and floral prints are super amazing if wearing them with Bermuda shorts during holidays. Amp up your style with charming bright colored shoes such that it serves as a cherry on top of your ensemble. This was all about Easter dress-up ideas. Do not hesitate to comment your ideas.